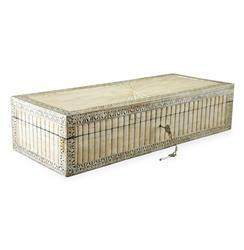 This large jewelry box gives you lots of space to store your exotic jewels, while also providing ample global style to your Moroccan boudoir. Its hand-carved bone exterior is full of detail, from the starburst etching on top to the black inlay design that dances across every edge. A lock and key ensure that the treasures inside remain yours alone.